NSD just keeps on going! I made this layout as a Garden Girl for the National Scrapbooking Day event going on at twopeasinabucket.com where a new project is being released each hour until 7pm central! My product focus was to use American Crafts Glitter Tape in a fun and unique way! 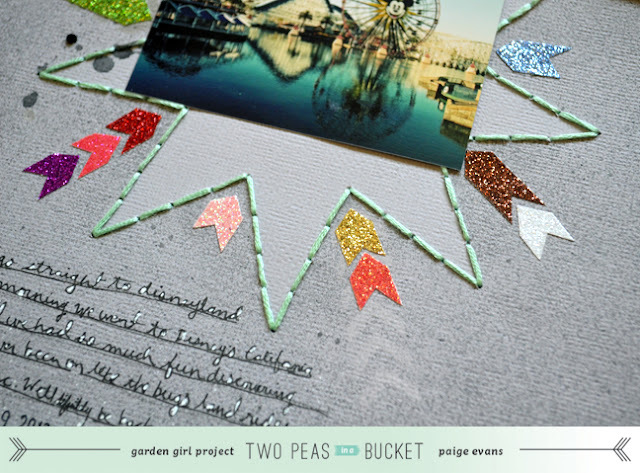 Description: I made this layout for the National Scrapbooking Day event going on at twopeasinabucket.com where a new project is being released each hour until 7 pm central! My product focus is glitter tape by American Crafts. The glitter tape is super bright, colorful, sparkly, shiny, and fun! Just like these pictures and the memories they bring from our day at Disney's California Adventure! I wanted to draw attention to my photos so I created four clusters of starbursts (mimicking the starburst on Mickey's Fun Ferris Wheel) and then made each one stand out by trimming the glitter tape into chevrons and pointing them into the grooves of the starbursts. 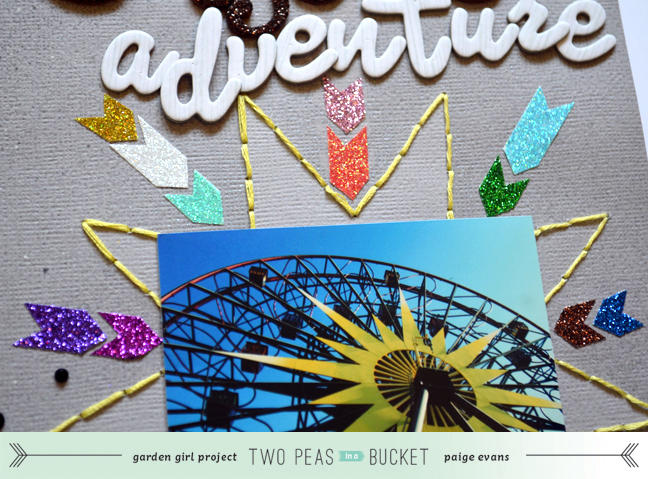 With a neutral tone background, the glitter tape really pops! You could also weave the glitter tape and make a fun focal point, layer it in strips and place a die cut shape over it for that fun trend, or use it like washi tape to adhere photos down. So many possibilities! 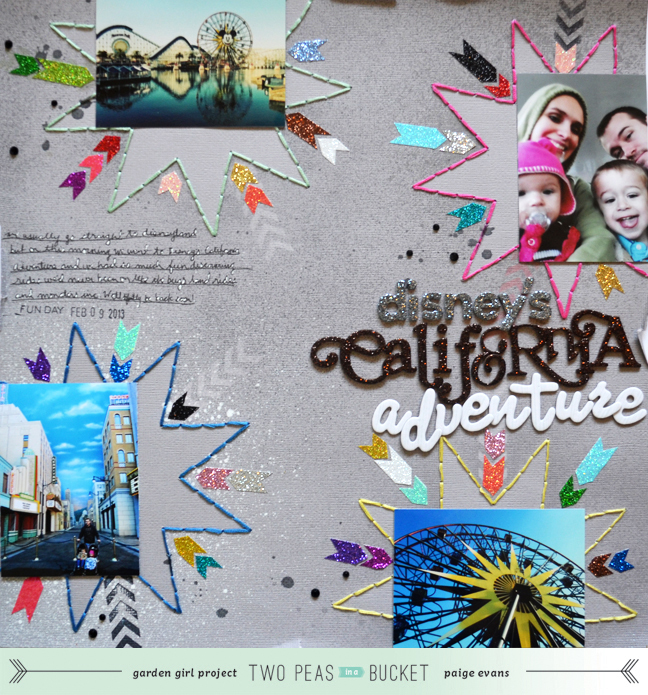 Journaling says: We usually go straight to Disneyland but on this morning we went to Disney's California Adventure and we had so much fun discovering rides we'd never been on like the bugs land rides and Monster's Inc. We'll definitely be back soon! How to: Die cut four starbursts from scrap cardstock, place them on each corner of a gray cardstock background, then spray over each starburst with a neutral colored mist; remove the starburst masks then stitch around the edges using a bright color of floss. Stamp chevron borders pointing into the starbursts. Trim glitter tape into chevrons and adhere them between the sunburst rays. Adhere a photo on each starburst and make a title on the right side using an assortment of Thickers. Use a black pen to write journaling on the left edge then fill in all the gaps of letters with a white pen. Stamp a sentiment and the date below the journaling. Drop black spray mist across the layout and add a few black jewels on top. Happy National Scrapbooking Day (again!)! WOW!! I am loving those stitched starbursts!! Awesome page! Sooooooo gorgeous!! LOVING the glitter bits and the stitching!! Wow! You've been busy!! I love all of your new layouts! ok, i really need to get some glitter tape! this LO is so neat! How do you come up with this cool stuff? !